Bands are a ring of metal, which fit around the back teeth (molars and sometimes premolars). Each tooth has its own shape and size. The bands are selected from a range of sizes. The aim is to select the tightest fitting band. The bands are sealed in position using a dental cement (like glue) containing fluoride to prevent any decalcification during treatment. 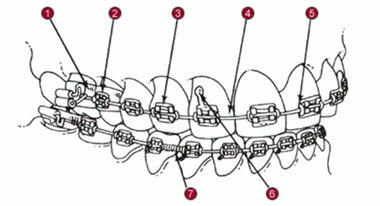 The part that holds the archwire against each tooth. The archwire fits into a slot in the bracket. Brackets may be attached directly to each tooth or to a band. plastic retractors similar to those used when the teeth were photographed. During this procedure the teeth must be kept dry. rings that tie the archwire into the bracket. WIRE – A tiny wire that ties the archwire into the bracket. This spring fits between brackets and over the archwire. Brush often and thoroughly using a soft brush and fluoride toothpaste. Eat foods such as soups, pasta, stews, chicken, meatloaf, etc. Soft foods do not cause damage to your wires and braces. Cut all foods into bite size pieces, as this causes less wear on the braces and makes it easier to chew food. Ice, popcorn, nuts, corn chips, jerky, hard candies, crusty bread, pretzels, carrots, etc. Soft drinks, candy, cookies, pies, cakes, etc. Solving problems "Before you panic"
If intact, leave in place and use wax to avoid soreness. If not intact, save all parts for the doctor. Try to nudge back in place with a blunt object. If wire is poking, try to bend with sturdy object such as a spoon or eraser. Cover with wax to avoid soreness and call the office. This can be carried over until the next appointment. Use warm salt water as a rinse & take ibuprofen or aspirin (or whatever you would take for a headache). Please download and print a summary of this information and Instructions for your New Orthodontic Appliances.